Medjugorje is one of the villages of the Western-Hercegovina municipality of Citluk, of historic Brotnjo. As the largest of the five villages which comprise the parish (Medjugorje, Bijakovici, Vionica, Miletina, Surmanci), Medjugorje gave its name to this extensive Roman Catholic parish. In recent times it has been one of the best known and most visited places of pilgrimage in the whole Catholic world. The name Medjugorje is of Slavic origin which means "area between two mountains." The territory of the Medjugorje parish spreads out at an altitude of 200 meters above sea level and has a mild Mediterranean climate that offers ideal conditions for cultivation of wine, tobacco, and fruit. The parish of Medjugorje was founded in 1892 and placed under the protection of St. James, patron saint of pilgrims. 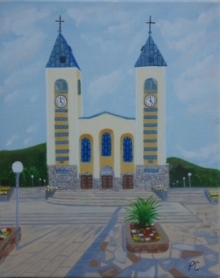 Five years later the old parish church of St. James in Medjugorje was completed. At that time it was both sufficiently large and beautiful, but built on earthquake prone ground, it soon began to sink and crack. Therefore, after World War I plans were made to build a new church, which was completed and blessed on January 19, 1969. At that time, it attracted little attention, even from the people of the nearest surroundings. In the summer of 1981 the church of Medjugorje became a focal point for the gathering of millions of pilgrims from all over the world. People began to come, see and be convinced of the extraordinary events in Medjugorje. There awaiting them was a message about the necessity of faith, prayer, conversion, fasting. . ., as the preconditions of peace and salvation of the world. After the beginning of the apparitions, the Church as well as the area around it were gradually developed. The remains of the old church are preserved in a park inside the traffic circle on the left side of the current shrine. Medjugorje is a unique event in the modern world. In the last fifteen years it has attracted approximately 20 million pilgrims from all over the world. Here they again discover peace, their humanness, and their closeness with God. They become witnesses of truth, love and peace. The place of Our Lady's first apparitions on the hill of Crnica is usually called Apparition Hill. It is situated several hundred meters above the Bijakovo hamlet of Podbrdo. A steep footpath leads from the houses to the very place of the apparitions. Now slightly widened by the millions of pilgrims who have so far visited the place of the first apparitions, the path has become visible from as far away as St. James. Numerous pilgrims, many of whom were born and raised on flat asphalt, often in unsuitable clothing or even barefoot, and on their knees, climbed over the sharp stones to the place of Our Lady's first apparitions. Half way up the path is located a large plain wooden cross. This is where on the third day of the apparitions, June 26, 1981, Our Lady appeared to the visionary Marija Pavlovic who, after having had a vision with the others at the usual place that evening, ran down the hill a little ahead of the other visionaries. At this place Marija once more saw Our Lady, now with a sad face. Behind her was a large cross and motioning with her hands she said, "Peace, peace, peace and only peace! Peace must reign between God and man and also between men!" Today this is a place where pilgrims stop, remaining in prayer and reflection on the message given by Our Lady, directed to man, and the world of today, which is so much in such great need of peace. The very site of apparitions is a large bare space on the rocky ground more than a hundred meters in diameter, completely trodden down by the feet of millions of pilgrims, without a single stem or blade of grass between the rocks, without hardly a lump of ground or even little rocks. At the site which the visionaries closely marked as the very place where Our Lady had appeared to them, a high cross is erected, planted into a pile of rocks. Only something truly extraordinary could have attracted such a great multitude of people to that place. At any time of day or night, any day of the year, individuals and groups can be found in prayer, in song, in deep meditation, and silence. Ivanka Ivankovic - Elez - Was born in 1966, had daily apparitions till May 7, 1985. On that day, confiding to her the last of ten secrets, Our Lady told her that for the rest of her entire life, she will have an apparition once a year on June 25, the anniversary of the apparitions. Mirjana Dragicevic - Soldo - Was born in 1965, had daily apparitions until December 25, 1982. On the last day of her apparitions, Our Lady told her that for the rest of her entire life she will have an apparition once a year on March 18, her birthday. Since August 2, 1987, on each second day of the month, she also receives an apparition and prays with Our Lady for unbelievers (those who have not yet felt or experienced God's love). Vicka Ivankovic - Was born in 1964, still has daily apparitions. Marija Pavlovic - Lunetti - Was born in 1965, still has daily apparitions. On the 25th of each month Our Lady gives Marija the monthly message meant for the parish and the entire world. Ivan Dragicevic - Was born in 1965, still has daily apparitions. Jakov Colo - Was born in 1971, had daily apparitions until September 12, 1998. Our Lady told him that for the rest of his entire life he will have an apparition once a year on Christmas. The daily evening program in the church takes place from 6 till 9 pm (6 pm Rosary, 7 pm Holy Mass, blessing prayers and the third part of the rosary). Adoration of the Blessed Sacrament is held Wednesday and Saturday from 10 to 11 pm and on Thursday immediately after the evening mass. Adoration and prayer before the Cross takes place in the church every Friday immediately after the evening mass. During the winter season the prayer program starts one hour earlier. Every Sunday at 4 pm a Rosary for Peace is prayed on Apparition Hill and every Friday at 4 pm the Way of the Cross is prayed on Cross Mountain. In winter its at 2 pm. Opportunity for the sacrament of reconciliation is available every day when the evening program starts and even earlier, if necessary. Mass in Croatian is celebrated Sunday and holy days of obligation at 8 am, 11 am and 7 pm, and on weekdays at 7:30 am and 7 pm. On Saturday mass for Croatian pilgrims takes place at 1 pm in both winter and summer. We request all organizers of pilgrim groups to announce their arrival, if possible, for the sake of more efficient organization of the pastoral ministry in the shrine. The prayer schedule here in the shrine is something that gradually evolved. Right from the first days of the apparitions, the children began to pray the Creed, Seven Our Fathers, Hail Mary's and Glory Be's with Our Lady. In her message on the 15th of March 1984 Our Lady said to continuously adore Jesus in the most Holy Sacrament of the Altar. In an unexpected apparition to Ivan on the 14th of August, 1984 to fast strictly on Wednesdays and Fridays and to pray at least the joyful, sorrowful and glorious mysteries of the rosary every day. On the 30th of August 1984, she said that the building of the Cross on Krizevac (Cross mountain) was in God's plan and that we should pray in front of it. The significance of the Cross, Our Lady referred to on the 12th of September 1985, saying that great graces are granted when we pray in front of it. Automatic Message: 060-325-325. By calling this number you can hear the latest message of Our Lady in Croatia, Bosnia-Hercegovina, Slovenia, Austria, Switzerland and Germany, as well as also the meditation and the news from Medjugorje which is updated every Wednesday. The Parish Office is open from 8.30 a.m. until the beginning of the evening programme in the church with a pause from 12.30-1300. It re-opens after the evening mass. We would ask that you carry out your requirements within the given time. We would ask that when visiting Apparition Hill or Krizevac not to light candles or leave rubbish. Candles can be lit at the wooden cross beside the church, and there is a place designated for the disposal of refuse at the bottom of the hill. Please encourage others to do likewise. The Hill of Apparitions and Krizevac are places of prayer. Because of this we insist on silence and we would ask you not to disturb others who are praying there. During the evening prayer programme, please do not walk around the church "sight-seeing". Not only does this disturb others, but you too should be participating in the prayer. In the same way when waiting for Mass in your respective languages, please do not enter the church while the other masses are going on in another language. The Parish of Medjugorje is a place of pilgrimmage and not a tourist site. Therefore we would ask you to dress accordingly. In January of 1991 the first edition of the magazine "Glas Mira" came out. It is a publication of the Shrine of the Queen of Peace. For the moment it is only published in Croatian. Whoever wishes may subcribe in the Parish Office in Medjugorje, either personally or in some other way. Along with the beginnings of Our Lady's apparitions the need appeared to present them to a broad public in the right way. There was never any intention of doing promotion in today's meaning of that word, but only to help people come to the truth. And today's activity has the same purpose. The objections are justified that there should have been organized from the very beginning an efficient system of spreading the messages of Our Lady's apparitions right from the heart of where they were taking place. However, the difficulties which prevented this are also justified. We recall that, when in 1981 the apparitions began, Medjugorje was groaning under communist dictatorship. That meant being constantly under the surveillance of the police and not even being able to get close to, much less to build modern means of communication. For just one word and even less than that, a person went to jail. That kind of situation made it hard to find skilled lay persons who would be able to work on the tasks of spreading Our Lady's messages by mass media. The third big difficulty was the negative position of the bishop toward the Medjugorje events, after his initial enthusiasm and courageous stand in the face of the communist authorities. Nevertheless, the difficulties did not kill all the good ideas. With the announcement of the arrival of democracy in 1990, a more systematic consideration of everything started. Sad to say, a horrible and unjust war began within a short time, so that all the ideas were postponed for better days. Due to the difficulties of the war, the number of pilgrims decreased. But it did not extinguish the desire in people to be in touch with Medjugorje and to know what is happening there. Due to that, the "Information Center" started functioning in November 1993. It began to systematize archives and library, and to send reports about events to the whole world. Meanwhile, necessary electronic equipment was supplied and in November 1994 the pilot number of the "Press Bulletin" was issued. It is sent by fax throughout the world, which was already the ordinary way of sending Our Lady's new messages and their interpretation. As time passed by, other new ideas have been developed like the Robofax, radio, Internet, local television. . . Their aim is to help make it easier to spread Our Lady's messages and nothing else. The organization of archives began with the gathering of material on healings which have so far taken place. At the present time, about 380 healings have been reported, a large number of which have the necessary documentation. Journalists were continuously coming and writing about the Medjugorje apparitions. Naturally, it was impossible to collect all of those newpaper articles, but a large number of them are stored in our archives. The most interesting of them are, of course, those from the communist period. One can read the fury of evil with which they gruffly speak about Our Lady's apparitions. Also many photographs were taken in Medjugorje in the course of these fifteen years. We preserve them in one section of the archives and use them in various newspaper articles or the preparation of some new book. Various types of books also were continuously written with the desire to search for and penetrate the heart of everything that has been happening in Medjugorje. There is a portion of them gathered together in different languages on the premises of our "Center." At the present time, we do not have adequate space to display them, but with further building up of the shrine we expect to achieve that. We are, hereby, requesting all those, who are able to help in the collection of books for our library or material for the archives, to do so. The "Center" is not just ours. The data we have at our disposal is also intended for all the other centers in the world, as well for individuals who wish to publish written works on the theme of Medjugorje events. Due to an increase in the arrival of pilgrims, the "Information Booth" began to operate again in August 1995. It was first set up in 1991, but the war interrupted its operation. At the present time it operates daily, except Sundays and feast days. The job of the "Information Booth" is to provide every possible type of information to pilgrims. It also gathers notifications of pilgrim groups coming, so that we are able in an easier way to organize services at the shrine. It should be mentioned here that it does not deal with accommodation of pilgrims. You can locate this service under "Tourist community in the village of Medjugorje- Bijakovici" tel./fax:+387-88-651-011. The "Information Booth" also provides the service of arranging a meeting of pilgrims with one of the visionaries. Such a meeting is organized daily on the premises of the shrine. Currently it is at 8:30am. In the same way it is also possible to arrange meetings with priests who are working in the shrine. We request all pilgrimage group leaders to bear this mind. With this kind of mutual interaction and organization you will be helping all of us. The "Association of Guides," that was reestablished in September 1995, is also closely connected with the "Information Booth." The "Association of Guides" was started in 1991 for providing information to Medjugorje pilgrims in the fields of religious, cultural-historical, archeological and ethnographic life. They are prepared with a definite training for these tasks. Upon arrival in Medjugorje it is possible to request their services at the "Information Booth." At the request of many pilgrims, and mainly of the centers of peace that are to be usually informed about everything on the current events in the shrine, we decided to inaugurate the publication of the Press Bulletin. It represents the official position of the shrine. In that way it is easier to avoid the start and spread of false information about Medjugorje events. In it one can find various news items, announcements, messages. . .that can enable the friends of Medjugorje throughout the world to keep contact with the shrine. Our Centre here also has the intention of co-operating with journalists, t.v. and radio crews who arrive here in Medjugorje or who are interested in Medjugorje. We wish to offer them the best quality information at our earliest convenience, about the events here. In the same way, we wish to offer our services to those writing books or articles, as well as those wishing to acheive academic degrees using the theme of Our Lady's apparitions. In the beginning we sent Our Lady's messages, their interpretation, and the Press Bulletin out to the world by means of fax. That consumed much of our precious time and burdened our work with large financial expenses. Due to persistence we succeeded in finding out about the computer system "Robofax." With its help everyone, at any time of day or night, can from our computer obtain the most recent message of Our Lady in five languages, its interpretation in English ( beginning on the 29th of the month), and the Press Bulletin in five languages every other Wednesday. The Robofax system functions very simply. First set the fax machine from which you are calling the Robofax to "tone mode." Then dial the Robofax number: ++387-88-651-555. When the connection is made listen to the instructions. Please wait for the instructions in your own language. In March of 1996 we began to give information about the happenings here through the Internet network. In doing this we have improved our ability of communicating with others. At the start of the war in Croatia and Bosnia-Hercegovina a public radio entitled "Radio Medjugorje" started to function. It dealt with political, religious, cultural, athletic and various other subjects. It was open to everything that was of current interest to the local people in Medjugorje. Since the equipment was weak and worn out, this radio had to discontinue after functioning for two years. Later on there were insufficient means for it to reopen. After the decline of the communist reign of terror, serious thought was given to the inception of a radio station under the patronage of the Queen of Peace shrine in Medjugorje. There were many ideas but just recently have we reached a final decision. We have decided to inaugurate a radio station that should start broadcasting at the latest by the beginning of the celebration of the 15th anniversary of Our Lady's apparitions. We envisioned this radio as a local station. We want it to be in the service of pilgrims as well as people who live in the parish of Medjugorje and its surroundings. Thereby, we will all breathe more easily together as brothers and sisters. Currently we do not have in mind a radio of wider range. Some day perhaps we will move on to accomplish that idea. But, we are of the opinion that a local radio must always exist. Its name will be Radio Mir' - Medjugorje." Those who want to get in touch with it can call at +387-88-651-300. What we are going to try to accomplish is at a certain time daily to broadcast various items of information and news for pilgrims of different languages. On this radio it will likewise be possible to hear the rosary, the mass, and all the other services from the shrine. Those who wish to give testimony about their experience in Medjugorje will be able to do so. Local people will be informed about everything taking place in the shrine and will be able to talk about anything bothering them. We will deal with religious, political, social, cultural, athletic and other questions. Our reporters are already collaborating on the radio named "Radio Herceg-Bosna" (audible in almost all of Bosnia-Hercegovina as well as a large part of Croatia). At times they also collaborate on "Croatian Radio - studio Zagreb." Once a month for a half hour duration we have a link to "Radio-Maria" from Italy. For the time being, we are not able to organize a TV studio that would be at the service of the shrine and of the truth without any kind of manipulation. But we are remaining completely open to this possibility. Currently, we are closely collaborating with two TV studios: Croatian Television (HTV)-Zagreb and Mostar. This way pictures from the shrine are broadcast both to the proximate and more distant area. Of course, we are the disposal of every well intentioned TV crew that come to Medjugorje. We also have charge over an automatic speaker HPT-a 9825 which works only in the Croatian language. At whatever time you call the number 9825 you can hear the most recent of Our Lady's messages followed by a meditation and news from Medjugorje which is renewed every Wednesday. Those who call from outside Croatia need to place the code for Zagreb 01 before the number. The "automatic speaker" began to work from the 17th of January 1991. It receives approximately 20,000 calls monthly. We have begun to distribute our books and brochures on Our Lady's apparitions. These come out in different languages depending on demand. Already from the very beginning we wanted to get in touch with other centers in the world. The greatest hindrance was the war and the very poor telephone lines. All of this is now improving, so that our contact with others will be facilitated. When representatives of individual centers come to Medjugorje, we would like to meet with them and exchange experiences. That will be of benefit to both of us. In our "Press Bulletin" - we have started to introduce individual centers. As we have seen this idea met a positive response. There are thousands of ways that we can help each other. From this presentation of the work of our Center and of the ideas it proposes to itself, I hope you were able to find a field in which we could more closely collaborate. For our part we are likewise open to any kind of collaboration with you. It is necessary to keep in mind that the "Information Center Mir' - Queen of Peace Shrine - Medjugorje," along with the priests who are working in Medjugorje, is the only official representative of the shrine. No one else can claim this, even if they live and work in Medjugorje. We are mentioning this for the sake of misunderstandings that occasionally arise.